Are you going hiking in the Outback? Need sustenance? Concerned about Dingos? How about some beans? Everyone goes right to beans when they need energy, right? DON’T THEY??!?! I don’t get it. Who’s the damn marketing WIZARD who thought that calling these things beans was a good idea? Oh, I see! It’s “Australian Style” Outback Beans! Sorry, my bad. I was thinking they were honoring French Outback Beans, which would have made no sense, but this absolutely does. Let’s eat some beans then. 1. The candy coating is bland. Bland, and just a bit thicker than you’d want. 2. The “licorice” inside isn’t licorice of course, it’s a red chew. Think Red Vines, but then knock that down to the very lowest bottom of the red chew universe. Still drawing a blank? Maybe my review of some of their other flavors will help. This kind of “licorice” is what gives licorice a bad name. People tell me all the time “ooh, I hate licorice.” Know why? Because companies like Wiley Wallaby are churning out crap like this and passing it off as legitimate. What’s worse, chain stores and supermarkets have adopted this as a go-to brand. So this is what we see as available licorice, and that aint right. These are terrible. Haaahrible. There’s nothing good about these, and you shouldn’t buy them. If you want a fruit flavored licorice style chew wrapped in coating, go Good & Fruity – they’re delicious! If you want the real black licorice in candy, of course go Good & Plenty. you can’t go wrong with the original gangsta’s of coated licorice, and in THIS situation….if it aint broke, by all means don’t try to fix it. If you must defy me and buy these, click the link below. But seriously…don’t. 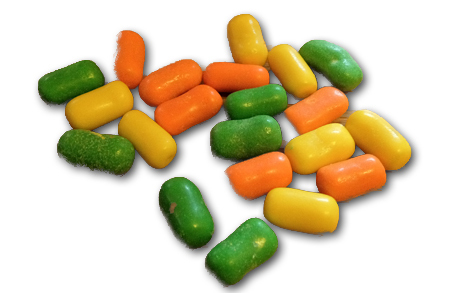 YOU OBVIOUSLY ARE NOT AN EXPERT ON CANDY, A FRIEND GAVE ME SOME OF THE BLACK LICORICE OUTBACK BEANS, I LIKED THEM SO MUCH I WAS LOOKING FOR A PLACE TO BUY THEM, FOUND YOUR NEGATIVE COMMENTS, YOU SHOULD KEEP YOUR OPINION TO YOURSELF. YOU EVER HEARD THE SAYING IF YOU HAVE NOTHING GOOD TO SAY, SAY NOTHING. IF YOU ARE ONLY TRYING TO PROMOTE GOOD AND PLENTY AND GOOD AND FRUITY THEN JUST DO THAT. THESE ARE BETTER I THINK, THEY ARE FRESH AND SOFT TO CHEW. I WILL TELL EVERYONE THAT LOVES LICORICE BECAUSE MOST OF MY FAMILY AND FREIND LOVE LICORICE. MY FAMILY HAS BEEN IN THE RESTAURANT AND BAKERY AND CANDIES BUSINESS FOR GENERATIONS, WE KNOW GOOD STUFF. 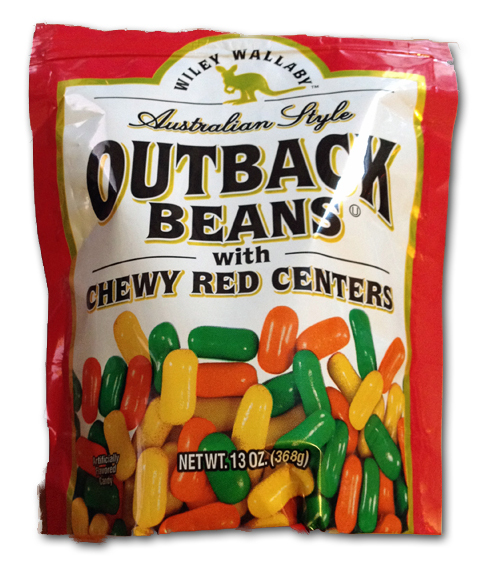 OH….the black licorice outback beans are so good. And they don’t have that nasty ingredient that Good and Plenty’s do that use crushed beetle shells. YUCK! It called Carmine. Carmine is a pigment produced by cochineal insects, which are ground up and purified to produce the pigment. GROSS! Not in Outback Beans!